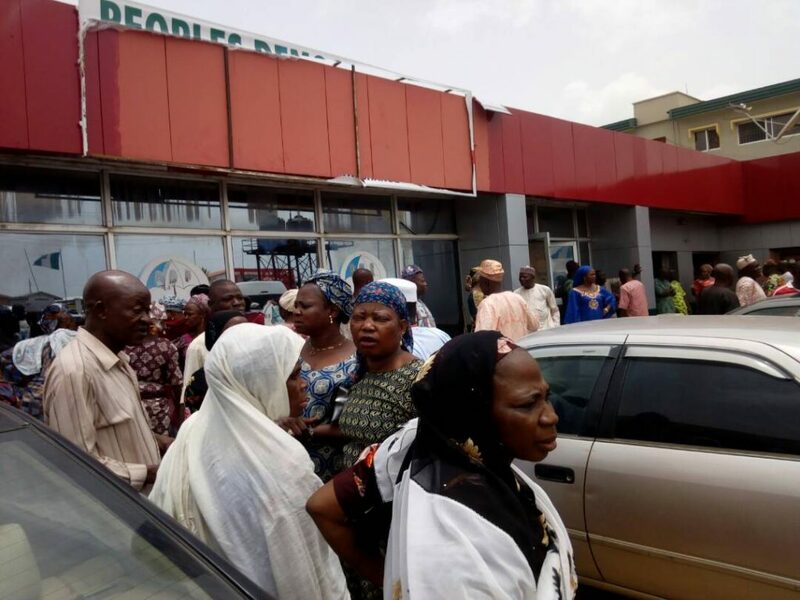 Leaders of thought in the Osun Chapter of the Peoples Democratic Party PDP on Friday decried the action of a former Deputy Governor of the State, Otunba Iyiola Omisore who burnt four flags of the PDP at the Ogo Oluwa secretariat of the party. Addressing a press conference at the NUJ Correspondents Chapel in Osogbo on Friday, the leaders want Omisore to publicly apologize for the “misdeed” or face disciplinary action from the National Headquarters of the main opposition party in the state. TEXT OF A PRESS CONFERENCE ADDRESSED BY EX- PDP POLITICAL OFFICE HOLDERS AT THE OSUN NUJ CORRESPONDENTS CHAPEL, Today Friday, April 6th, 2018. We address you today on behalf of the teeming members of our Forum who are former members of the National Assembly, Osun state House of Assembly, Commissioners, ex-local government chairmen, vice chairmen and councilors, Former Special Advisers and Executive Assistant to the Governor, Board chairmen and Heads of Agencies. We are all leaders and stakeholders of the Peoples Democratic Party in Osun state and are therefore very interested in the progress of the party and its success in all elections beginning with the Governorship polls in September this year. 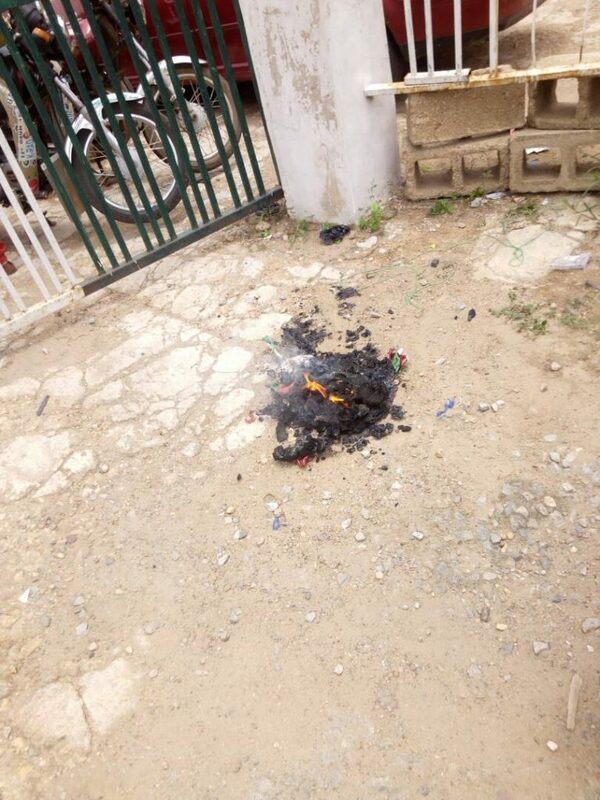 We use this medium to state that we are deeply shocked, saddened and disappointed at the most recent conduct of a former deputy governor who is also a former senator, Otunba Iyiola Omisore, who was reported to have personally supervised the burning of the PDP flag and other party symbols by some hoodlums at his office in Osogbo yesterday. 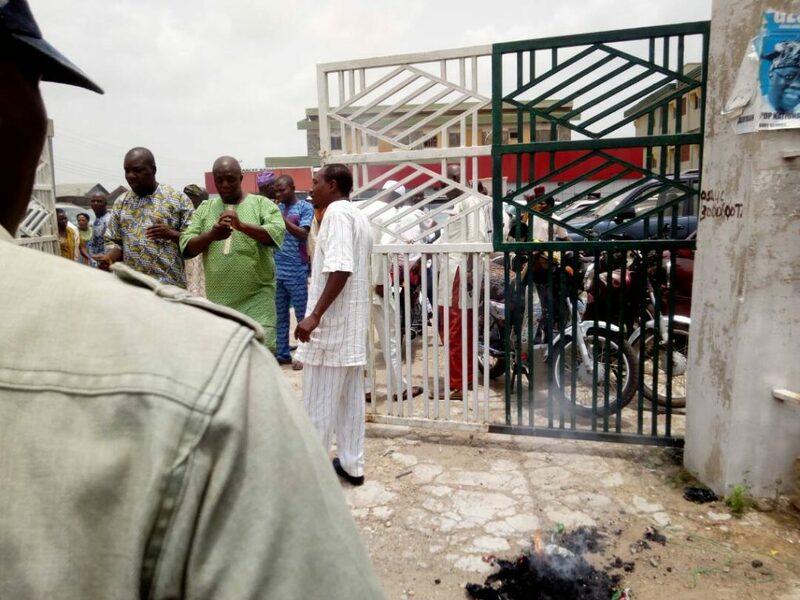 Picture showing him superintend over the burning of PDP flags and banner at the former PDP secretariat, Ogo Oluwa went viral on all Media yesterday.It is a fact that his yesterday’s action was the peak of the senator’s self-determined war against the PDP, the party of which he has been a major beneficiary. To those who may not know, Omisore’s fight against our party dated back to year 2014 immediately after the gubernatorial election that held in the state during which he was our candidate.That the PDP lost in the election may no longer be news but the secret behind the party’s undeserved loss at the poll remains the issue that thereafter culminated into so many regrettable developments for the party. As a serious party after the elections, various committees were set up to probe into why we lost and there were many serious and disappointing revelations which include but not limited to the fact that the senator who was our candidate helped his pockets to a great extent with funds meant for the election. He couldn’t account till today for several billions of naira meant for providing essential logistics for the 2014 elections. Attempts to ask him questions led to so many unpalatable reactions from him which included the ejection of the party from his Ogo Oluwa property which hitherto served the party’s state secretariat.Amidst this came the issue of EFCC allegations, investigations, arrest, detention, and refund of several billions of naira which he allegedly collected for the purpose of the governorship elections. Despite his isolation of the party at the time of collection and appropriation of the funds, as a responsible party we stood by him during the travails. Our party joined him to suffer the image battery because of the brotherly love and respect we had for him.All these could not appease the former Deputy Governor who had since turned himself into an albatross for the party and continued to promote factions and disloyalty to the party leadership especially under the leadership of Prince Uche Secondus. The hallmark of this untoward act was yesterday’s desecration of the party symbols in an apparent show of gross indiscipline and ingratitude. This is quite unbecoming of a man who had been greatly favored by the PDP in his times of trials and need and still hoped to fly the flag of the party as a governorship candidate. It is unfortunate that in spite of the assurances given by the national leadership of the party to provide a level playing ground for all governorship aspirants in the PDP, Otuba Omisore would rather prefer to be made the automatic candidate of the party in flagrant disrespect to the constitution of the party and the resolve of the Uche Secondus led NWC to deviate from the impunity of the past and allow full internal democracy. It is obvious that Otunba Omisore is terribly afraid of any competition from other aspirants. This is clearly an admission of his total loss of popularity among the rank and file of party members and indeed his unacceptability by the electorate. It is also on record that two other political parties recently approached by Otunba Omisore in his political desperation as his Plan B have both rejected him hence his utter state of confusing utterances after yesterday’s events. We are happy inform you that over 90% of his hither-to supporters, some of whom were deceived with a phantom empowerment programme to attend the meeting in his office yesterday have vowed to remain in the State PDP under the leadership of Hon. Soji Adagunodo. .2. That Otunba Omisore must unequivocally state his stance on the continued membership of the party or otherwise rather in view of the conflicting statements emanating from his aides and confidants in the last 24 hours. 3. That in the event of Otunba Omisore choosing to remain in the PDP, he must within the same 72hours withdraw all court cases instituted by him through his proxies and explore the internal mechanism in the party to resolve any grievances he has. 4. That in the event of a failure of Otunba Omisore to do the above, we call the leadership of the party at all levels to take appropriate disciplinary action against him in order to show that no single individuals inordinate ambition is above the larger interest of the party. We thank you most sincerely for your attention.